Flowering depends upon long-distance transport to supply water for reproductive mechanisms to function. Previous physiological studies suggested that flowers operated uncoupled from stem xylem transport and received water primarily from the phloem. We demonstrate that the water balance of Southern magnolia (Magnolia grandiflora) flowers is regulated in a manner opposite from that of previously examined flowers. We show that flowers of Southern magnolia rely upon relatively efficient xylem hydraulic transport to support high water demand during anthesis. We measured rapid rates of perianth transpiration ranging from twice to 100 times greater than previous studies. We found that relatively efficient xylem pathways existed between the xylem and flower. Perianth hydraulic conductance and the amount of xylem to transpirational surface area ratios of flowers were both approximately one-third those measured for leafy shoots. Furthermore, we observed that perianth tissues underwent significant diurnal depressions in water status during transpiring conditions. Decreases in water potential observed between flowers and vegetative tissues were consistent with water moving from the stem xylem into the flower during anthesis. 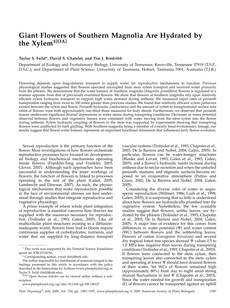 Xylem hydraulic coupling of flowers to the stem was supported by experiments showing that transpiring flowers were unaffected by bark girdling. With Southern magnolia being a member of a nearly basal evolutionary lineage, our results suggest that flower water balance represents an important functional dimension that influenced early flower evolution.